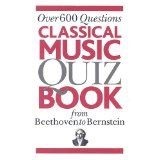 Over 600 questions, from Bach to Bernstein. A treasure trove of questions for classical music lovers. No matter how much you think you know about classical music, you’ll find plenty of baffling questions and surprising answers. Challenge your friends, try to answer questions round by round, or read it just for fun. You’ll have hours of enjoyment with the ultimate Classical Music Q&A book!